The fresco, more than 8 meters long, has been set up in the hall of the Institute of Transplantation of Nantes, France, where all patients, doctors and scientists meet every day. The fresco has been conceived by patients after having shared their feelings about how transplantation has changed their life course. The artistic content of the fresco, and the organization of this realization (it was fully realized by 4 volunteer patients), has been managed by the artist Sylvie Zampolini, alias ZAMPO. “Giving the opportunity to patients ta express about their life with the doctors, nurses and all hospital staff, is also a way for them to say thank you and give an expression to their side of the story”, said ZAMPO. The whole operation, sponsored by the start-up XENOTHERA, was also an opportunity to underline the huge investment of Centaure, a foundation strongly involved in the field of transplantation, which is celebrating is 10th anniversary in 2017. 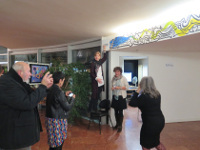 Sophie Brouard, CEO of the Centaure Foundation, was honored to inaugure the set-up of the fresco named “Chemins croisés”, a title chosen by the patients who painted it. “XENOTHERA vision is to introduce breakthrough innovation in medicine, built on state-of-the-art science, for the stake of patients’ well-being, especially in transplantation, where they have to undergo this very particular period in the waiting list and the first few weeks after transplantation. As a medical doctor, and scientist, I know that this central question has to be kept in mind when we are using highly technical medicine and surgery. This sponsorship of XENOTHERA reflects our engagement to stay close to all actors who contribute in this major health issue”, said Odile Duvaux, the CEO of XENOTHERA.